I recently bought myself a microscope. I've not had time to take it into the lab to get it calibrated yet, but have started really getting into using it, latterly whilst I have the Loop of Doom on Sky News running in the background. 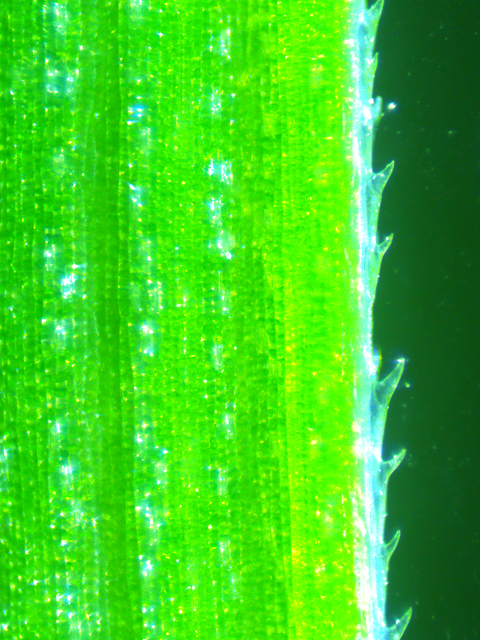 So here's a composite photo micrograph of a blade of grass, as the spine edges weren't in focus at the same time as the surface. This photo is at 40X and is surface lit. The grass feels very rough to the touch, and as can be seen from the edge this is due to silicate spines, which also cover the breadth of the blade, as can be seen from the white patches on the surface of the blade of grass. These are called phytoliths, which is greek for plant-stones. I already knew this was a defensive mechanism, but wanted to check out some more detail, and came across this interesting note from York University. They looked at both the damage the silica does to voles and the damage the voles do to the grass, and how that affects the silica. 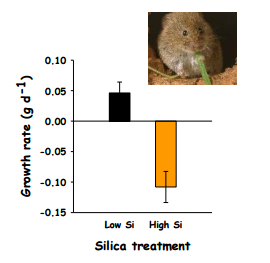 So when the voles eat grass rich in silicon they exhibit lower growth rates (orange) than when fed with grass low in silicon (black). What is amazing is that when the grass is cut with scissors (black) it responds by producing about a quarter of the phytoliths as when voles damage it by eating blades of grass. 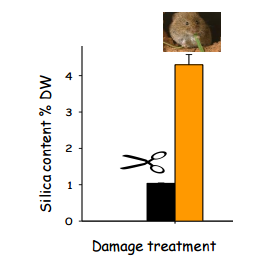 The obvious conclusion from this research being that voles need scissors. Is there any point to this research? Is it a sign of wasted public money? Research doesn't have to produce useful economically exploitable results, really, it just doesn't. Anyone who looks at the spines on a blade of grass and doesn't wonder is the sort of person I find intensely tedious. They're often the sort of people who spend their time on Twitter discussing the Kardashians (who the FK are they?) The world is full of them, and I tolerate them. Now the sort of person who looks at the blade of grass, ponders why it is rough, ponders how it fixes silicates, ponders how the hell it responds differently when cut by scissors or eaten by a vole. The sort of person who is in awe of the ancient lineage of evolution that gives rise to the subtle perpetual war between species. The sort of person who ponders the nature of the feedback in which more voles leads to more vole damage to grass, which leads to more phytoliths on the grass, which leads to lower growth rates of voles, which leads to higher death rates in the cold of winter, which regulates the vole population (one might hypothesise). Now that is the sort of person I find interesting. So what of the vapid dolts who demand that research always produces economically valuable results? They know the cost of everything and the value of nothing, and that is not an admirable trait. Don't try to frame the research in terms of how it might produce economically useful results, that is pandering to their limitations. Tell them instead that they don't deserve the lineage of learning from the Greeks to the Large Hadron Collider, and that until they appreciate that, they won't understand what it is that has really made our civilisation great. The problem of course arises when you're a proper scientist and the vapid dolts are in charge of research budgets. Well then you just have to play their game of limited vision. Nobody said life was perfect. Sorry.